When you discover inaccurate items on your credit report, use this form to correct the record under the Fair Credit Reporting Act. Includes room for account numbers and other details. I recently discovered inaccurate items on my credit report. Please consider this letter my formal request that these items be investigated immediately and that the inaccurate information be removed (deleted) so that my true credit history is reflected. I make these requests under the provisions of 15 USC Section 168li of the Fair Credit Reporting Act of 1997. 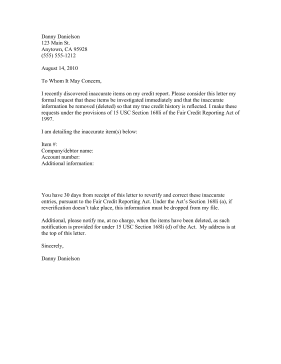 You have 30 days from receipt of this letter to reverify and correct these inaccurate entries, pursuant to the Fair Credit Reporting Act. Under the Act's Section 168li (a), if reverification doesn't take place, this information must be dropped from my file. Additional, please notify me, at no charge, when the items have been deleted, as such notification is provided for under 15 USC Section 168li (d) of the Act. My address is at the top of this letter.